Darklord - King of War: Black Dragon Report - Scenario? I recently traveled down to Black Dragon for a 2K KoW event, this would be 4 games so excellent practice for the upcoming CoK UK. After my poor performance at Altrincham I refocused my list and tactics, this would basically be a 2 pronged attack pattern, the Stampede’s with a Beast pack, the Spirit Walkers and the foot Shaman being the first group and the Lycan Hordes with another Beast Pack and the Mounted Shaman being the 2nd. The Avatar a new addition, goes wherever I feel he’ll help most, usually opposite something shooty on a flank if possible. I deploy him last too. As you can see if you look back at my Alt list, I’ve dropped two units of chaff, and this still felt like it was enough, possibly 3 is the sweet spot. 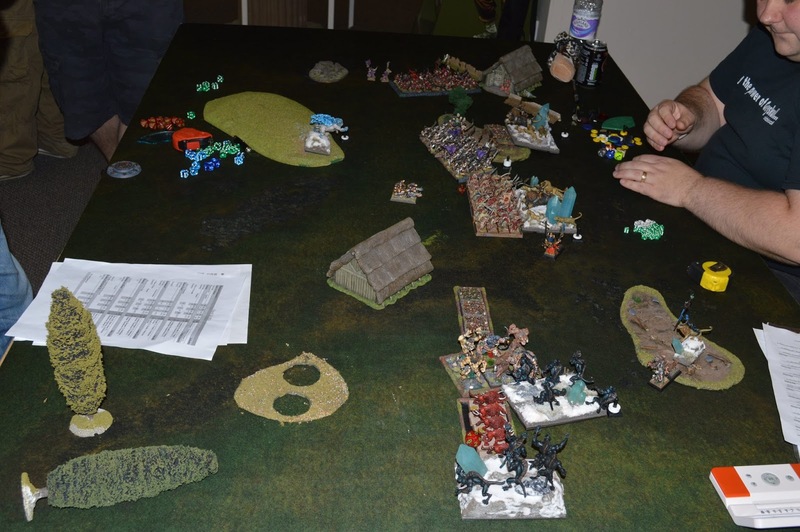 Game one - David Hetherington – Dwarves – Push. Dave is a new player, but was very enthusiastic and we had a great game! He forgot quite a bit but I was happy for him to go back and do it, and where I spotted it I reminded him too, which he appreciated. My army though swept in and started taking his units off here there and everywhere. My turn 3 I had the opportunity to charge the Warlocks with a Lycan horde, 1, 2, 3, all dead, 3 units routed by one unit in one turn is a new record for me! Elsewhere everything was falling apart for the Ratkin and be the end of the turn there wasn’t much left. This ended with another tabled result and max points for me. Nick went first and the dwarves sped forward! On my left the Brocks all moved into charge range of my Avatar but not the Stampede, I used a Beast pack to delay a Regiment of Brocks, Allowing my Stampede and Avatar to move into better positions but out of range of the other Brock Regiment. The Beast pack worked great as on the following turn the Brock riders rolled a double 1 to rout them! I would get my comeuppance later though… The Elementals advanced, and I could have charged them with my Lycans, Nick had set up flanking units though and I judged it too risky. Instead I swept a unit forward ready to flank. I sent my Spirit Walkers in the central Ironguard regiment which were holding a token but they did little. 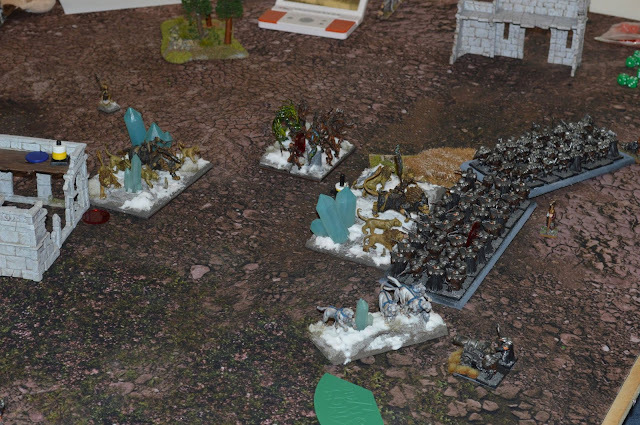 The Ironguard countercharged and routed the Spirit Walkers, even worse the flying King charged past and engaged a Stampede keeping it in place and stripping their TC. In retrospect I wish I’d Banechanted them straight away, but went for Heal instead. The Greater Elemental got in the face of my flanking Lycans, but I nimble charged past into the flank of his Elementals routing them in one go. Due to Surge I was forced to turn round or have him into their rear, this was a shame as they were in an otherwise great position. I did Banechant these guys, but still got stuck with the Greater Elemental the next couple of turns. Around turn 4 things we’re looking ok, I’d bane chanted my Stampede and they smashed the King, I’d got my other Stampede into Brocks and my Avatar into the Berserker Brock Lord, all I needed was reasonable nerve rolls and I would rout several units. I rolled Double 1, not once but twice and then a 3 on the King. (which wavered him at least) This was a terrible setback and in the following Dwarf turn The Brocks routed the Stampede leaving me with just a damaged Avatar vs three units! My left flank had collapsed...The Dwarves were now solidly in possession of all 3 loot tokens. In the centre the King passed his Headstrong roll, (grumble) and got joined by the Ironguard regiment, they wavered the Stampede with a high roll. (noooooo!) The Dwarf shooting also wavered my Lycan Horde in the centre… The Avatar ended up flying away as fast as it could and abandoned the flank…This meant I only had the one charge that turn, the other Lycan horde, which finally finished off the Greater Elemental and turned to face the Dwarven centre. The Dwarf King and Ironguard regiment continued hammering my Stampede and routed it, overrunning forward and that was most of my centre gone too! An Ironguard Regiment (with a token) got in the face of my flanking Lycans, and the Brocks moved a little closer to the centre. This was now my 5th turn and all looked bleak, I was left with the Avatar, a Shaman and both Lycan Hordes. (one wavered) However Nick had made a key mistake overrunning after killing the Stampede, I was able to Nimble charge my Lycan horde past the Regiment in front of them and into the Dwarf King, killed him then overrun into the Ironguard’s flank killing them and grabbing a token! I killed off the remaining Flame Belcher with my Avatar. This left Nick with little to do on Turn 6, he just prepared his unit for the charges, My Avatar routed a Brocks Regiment and the Lycans took the final Ironguard Regiment, granting me anothr token! In the end I grabbed the tokens and killed most of Martins army giving me a big win! Phew I thought I’d lost that for game for a while. Martin had a balanced Ratkin list, this was more challenging for my army than the shooter centric list of Andy’s from earlier. Martin got first turn and advanced, being Invade this made sense, but I decided against getting too close and let Martin move into my charge range instead, which he did. My turn two I unleashed my Lycans, they double charged and took out a Brute horde quite easily, I advanced carefully and positioned my Avatar for a flank charge. Then turn 3 Martin moved up and jammed my Stampede’s with chaff. With one unit I was able to kill them and then back up out of charge range of the Shock Troop Hordes, the other killed the Hackpaw chaff but still had to deal with Warriors. My Avatar was able to charge a flank but decided against it and went round to the rear instead. And lets let everything come to my side of the board on an Invade, surely that will work right? I was running out of units now, My Avatar finally got it’s rear charge into the right Shock Troops horde and routed them, The Lycan horde routed a warchief that had killed my foot Shaman. The unwavered Stampede got chaffed up by a Weapon Team, which it duly dispatched. 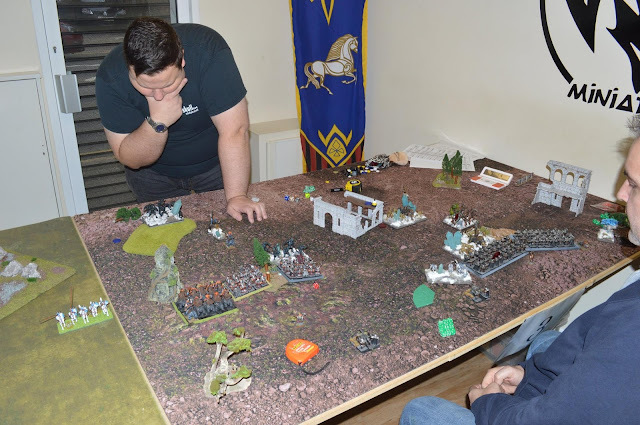 My final turn dawned (no turn 7’s at this event) I used my Lycans to finish of the Vermintide, and my Avatar to kill a Warlock, and the game ended. I knew going into the game that if I could get a draw I would likely win the event, and as I was ahead on points I felt reasonably confident. Martin however said, “I Win” Turns out we were playing an INVADE of course, I’d completely forgotten. 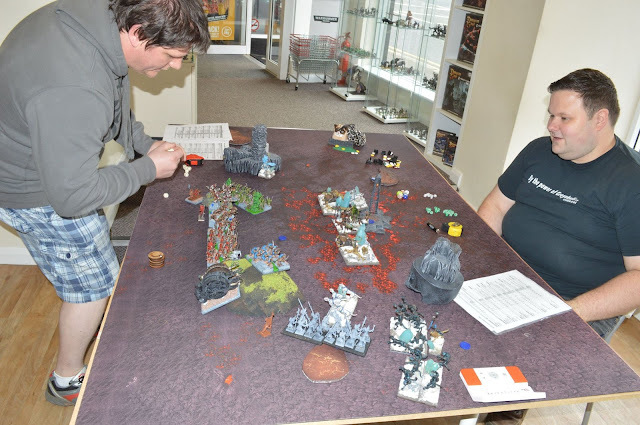 If I’d even remembered turn 6 I could have flown the Avatar into the other half and claimed the draw… As it was Martin won the game and the tournie! Army wise I was very happy with it, it’s low defence but the speed means you don’t need to weather shooting for long. The Avatar which I'd added in for this tournie worked great, he was targeted by shooting a fair bit which saved my other units some damage, pairing him with a Shaman is nice to combo with the Iron resolve too. The Very Inspiring source also came in handy when the nearest Shaman couldn’t quite cover everything or died. I’ll certainly use him again, I liked the large Dragon like threat.